For many automobile companies, World War II was sort of an interruption. The cars they started building in the late 1930s would re-enter production upon the cessation of hostilities in 1945 (or shortly thereafter if their facilities were damaged). For instance, Delahaye’s luxurious 135 was introduced in 1935. It, and it’s successive line of cars including the 138, 148, and 168, would remain in production until 1954. Introduced in 1936, the 135M was a 135 with a larger engine. In this case, it sported a 3.6-liter straight-six making either 90, 105, or 115 horsepower depending on configuration. This model remained in production until Delahaye closed up shop in 1954. Henri Chapron started his coachbuilding company in 1919 and he really hit his sweet spot in the 1930s and 40s. Cars like this beautiful Cabriolet are among his most stylish work. Owned by the consignor since 2002, this car was restored in 2003 in a gorgeous two-tone paint scheme. The pre-sale estimate is $160,000-$195,000. Click here for more info and here for more from this sale. 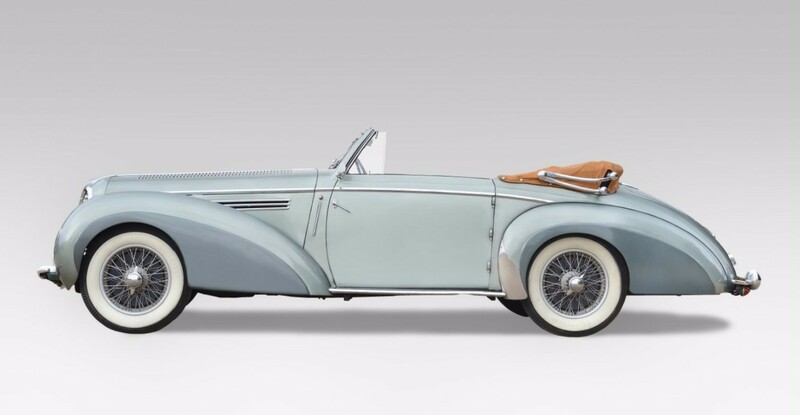 This entry was posted in Uncategorized and tagged 135m, 1949, auctions, cabriolet, cars, chapron, classic cars, delahaye, osenat by classiccarweekly. Bookmark the permalink.